BECKHOFF Automation presents the XFC (eXtreme Fast Control0, a new range of EtherCAT PLCs with 12.5 μs cycle time continuously maintained from the PLC to the I/O signals. Proving its technological leadership in fast control technology, Beckhoff provides an innovative system that makes machines and plants significantly more efficient. 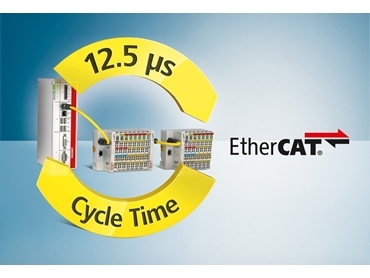 The components in the new XFC EtherCAT PLC include a high performance CPU, a Beckhoff industrial PC with control software to match (TwinCAT 3), ultra-fast I/O components with 1 μs latency as well as a fast industrial Ethernet system, EtherCAT. According to Dr Dirk Janssen, Manager Software Development at Beckhoff and one of the inventors of EtherCAT, when the EtherCAT was first presented in 2003, the performance of the new fieldbus technology was still miles ahead of the controller capability of the time. TwinCAT 3 and the current IPC CPUs are closing the gap. He adds that the 12.5 μs presentation shows the capabilities of the Beckhoff system together with the EtherCAT terminals. Dr Janssen says that the bus cycle time is actually in itself not decisive, as a fast fieldbus only becomes a fast control system with a capable controller and ultra-fast I/O components. Only with EtherCAT can the highest performance of the fieldbus be implemented continuously through to the I/O signals, with technologies relying on bus couplers with a separate local I/O bus suffering from system-related disadvantages. The presentation at Hannover Messe 2012 is composed exclusively of standard components. In typical EtherCAT style, the controller does without special fieldbus hardware and implements the master in software. The EtherCAT Terminals are from the Beckhoff product portfolio and the fieldbus itself is standard EtherCAT. With XFC, control loops are closed much faster and the delay times after transitions are drastically shortened.